More jumping skills than any other course. The Fundamentals of BASE course covers pilot chute assist, hand held, stowed, static line, slider up and slider down jumps. More packed jumps per day than any other course. Students typically make 4-8 jumps per day, and average around 14 jumps per course. 4 full days of instruction. Class days average around 12 hours of instruction. Dedicated classroom facility with video screen and white board. Every course includes 12-15 hours of classroom instruction on a wide variety of topics. Indoor packing area with heat and air conditioning. Pendulator launch simulator. The pendulator is an extremely effective still air exit training system created by the Stavanger BASE Klubb. Students train repeated exits with immediate instructor feedback, rather than waiting an hour or more between jumps. Gear use during the course is included--no extra rental fees. Students are also welcome to use school gear after a course, for the duration of their stay in Twin Falls, to establish currency and practice other skills. A packing video, packing tools, a course reader, a copy of Matt Gerdes "The Great Book of BASE," a t-shirt, and a BASE logbook are part of the instructional package. There are no additional charges for any of these materials. Video of every jump. This helps to correct mistakes, and students are given copies of all the video. Multiple rigs for each student, allowing us to make more back to back jumps. Immediate repetition helps students progress faster and correct mistakes immediately. 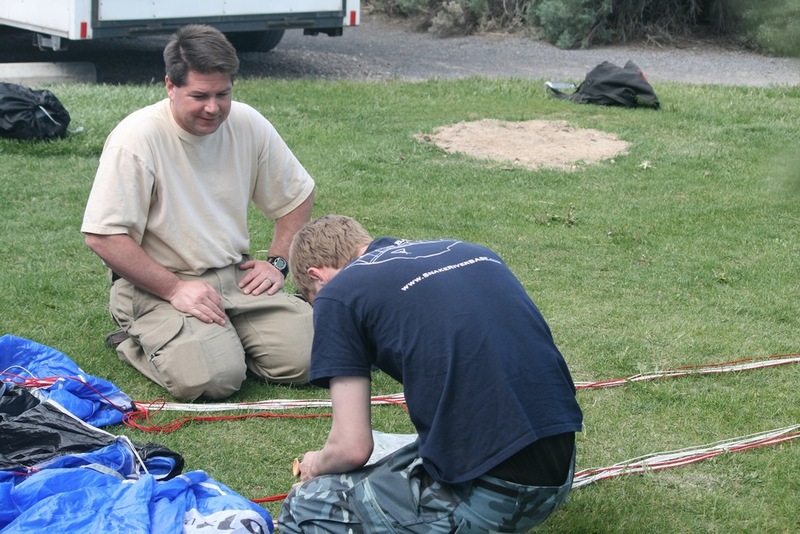 By eliminating the need to re-pack before the next jump, the time between jumps is reduced by about 2 hours. Students become familiar with a wide range of gear and are better educated when it comes to buying their own gear. Using multiple rigs also lets us take advantage of (faster) instructor pack jobs to move more quickly through the learning progression, which can be especially important if we experience weather delays (and limited jumping windows during windy periods).